Members of a women’s farming collective in Northern Ghana save, trade and have protected from extinction at least five varieties of native seeds. 2014 has been named by the UN’s Food & Agricultural Organization (UNFAO) as the International Year of Family Farming. Its focus is to raise the profile of family and smallholder farming by bringing world attention to its role in eradicating hunger and poverty, providing food security and nutrition, improving livelihoods, managing natural resources, protecting the environment, and achieving sustainable development, in particular in rural areas. These issues are at the core of CFTC’s food security work, and we have seen some great gains in supporting family farmers especially in Ghana – where our CHANGE project is coming to the end of its first year, and also in Ethiopia – where Self-Help Groups are a key method to create income generation opportunities and sustainable, often agriculture-based, livelihoods primarily for women. 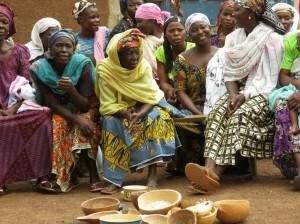 In Ghana and Ethiopia (and also in Uganda, where CFTC’s local partners support Village Savings & Loans Associations), where access to land for women to farm is a significant barrier, promoting agriculture-based livelihoods for women has the added benefit of closing the gender gap which lies at the root of much rural poverty. Since the beginning of the CHANGE initiative in 2013, CFTC and its local partners have helped boost membership in farmer-based organizations to 83 per cent, a significant increase over 32 per cent in the baseline study. Of the members, more than 70 per cent are women (exceeding our target of 40 per cent). Increasing inclusion of women in family farming and income-generation activities is particularly crucial as they are under-represented and therefore under-contributing their skills, knowledge and labour. Increases to family income as a result of women’s participation in the labour force is directly tied to positive outcomes for families and, especially, children’s health and well-being. 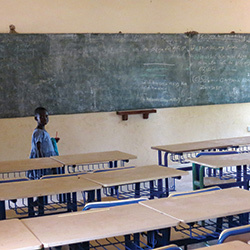 In Northern Ghana, women comprise the majority of the estimated 76% illiteracy rate – and participation in farmer’s based organizations and other agricultural and non-agricultural income-generation groups is a prime strategy to improve literacy among women – increasing their own productivity and driving more widespread support for education, especially for girls.